Description: this juvenile Tyrannosaurus has long slender legs, tiny teeth and a small head compared to adult Rexes. It does have the odd little two fingered arms seen on larger Rexes though. This figure stands in a neutral pose except for its tail, which is bent to the left somewhat. Its lower right leg hangs a little loose (though still attached) and can be twisted around, as if it’s broken or damaged in some way. 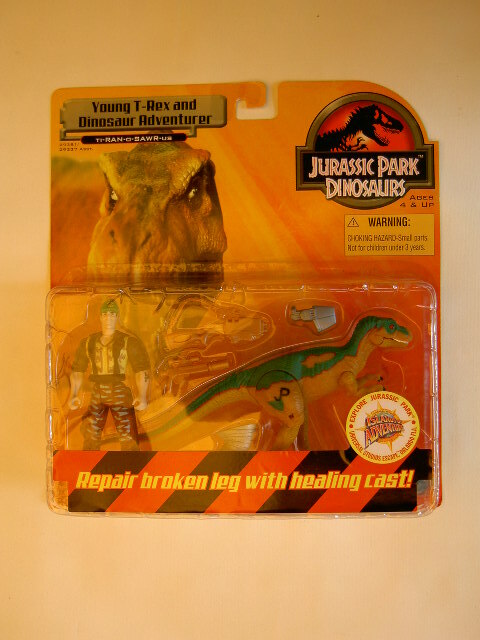 The leg cast can be applied on the leg by sticking the pin on its inside in the little hole in the figure’s upper right leg. That way the twisted leg will “switch” back and the animal’s leg is healed; at least, that's the general idea. The Rex’s mouth can also be opened and closed. This animal comes with one piece of capture gear which can cover its head, like a muzzle. It’s coloured shiny metallic grey, as is the leg cast. Young Rex sports a two way paint job. The lower parts of its body (most of the flanks, belly, arms, most of the legs, throat, lower half of the head, underside of the tail and its snout) are coloured very light brown, almost yellow; on either side of its body it has an additional shape of the same colour near its back. The rest of the body (top part of the head, neck, back and upper parts of the flanks and legs and topside of the tail) is coloured green, with a single green spot on both upper legs. A thin red line literally separates both colours from each other, running from the eye socket all the way to the tip of the tail. The separate brown spots near the back also feature a similar red line on top of them. Baby Rex sports black claws on both hands and feet, white teeth, a red tongue and red eyes with black irises and white pupils. A black JP logo is located on its right upper leg. The Dinosaur Adventurer stands in a mostly neutral pose with one leg in a slight forward move and the other in the opposite direction. His black eyes (with black eyebrows) stare mindlessly in the distance. He has black hair and is quite muscular, but his head is somewhat disproportionate (i.e. too small) compared to his body. He wears a green cap with the JP T-Rex logo on it. He sports a bit of a military look with camouflage pants (brown with blue spots) and a yellow shirt that has a lightly brown spotted paint job, as well as a dark brown collar and sleeves. His shoes are black. He’s got black utility belts with pockets around his chest. Other details include pockets on his sleeves, a black machete on his left leg and a large pocket on his right leg, as well as a black InGen logo “tattooed” on his left lower arm. His torso can move around to a small extent, courtesy of the original sculpt's dinosaur action, which is lost in this repaint since it does not come with the necessary Compsognathus figure. Dieter comes with two different light brown (almost orange) guns: these guns do not have any action options like most of the weapons that come with human figures do, but are mere extra gadgets, since in this figure’s case the figure itself was supposed to provide the action. Since I’m not an expert on weaponry I can’t determine what type of guns we’re dealing with here, but aside from their colour they look much more realistic than the regular weapons the human figures carry. The Adventurer can wrap the biggest of the two guns around his shoulder, while the other one fits in his hands only. Analysis: the junior T-Rex is back with a vengeance for Wave 2 of the first JP: Dinosaurs line! Good thing too, since its predecessor featured a hideous paint job, forcing this successor to do better, which fortunately, it does. This paint job is a whole different thing altogether, and comes with various details too add to it. Granted, light brown and green are not the best of friends from an artistic point of view, but they work well enough on this figure. The Yin/Yang effect achieved by having one spot of the one colour pasted in the other colour's territory is a nice and original touch, as are the red lines separating both colours. The attention to details is certainly there, which is not only proven by the fact that all claws are painted, but also the effect in the eyes which this time have both irises and pupils painted, making them look much more real and almost alive. Also, the way in which these eyes are painted makes it look like the Rex is staring right in front of him, eyes focused on potential prey no doubt. Apart from the successful paint job, this remains a solid dinosaur figure. It looks very close in shape to the little T-Rex seen in the TLW movie, a likeness that hasn't been seen all too often in JP dinosaur action figures. The leg action is a fun option, and also nigh on movie accurate, though it has its downsides (leg cast covers only half the leg and looks silly, leg often swivels back on its own accord, leg is somewhat fragile, etc.). The muzzle and leg cast have been repainted to be a bit more shiny but are otherwise unchanged. The Dinosaur Adventurer's new paint job is less radical than that of its extinct companion. The paint scheme is the same as before, but the colours used this time look less appealing together, not to mention less sufficient for camouflage use. Also, this is the second time we see this particular head sculpt in this line, meaning this might as well be a twin brother of the Dino Trainer that came with the Pachycephalosaurus of this toy line. A different head sculpt would have been preferred to add some diversity in human figures to this line. This figure still has a moveable torso, which adds a little bit to playability even though it has no real function in this set. The new paint job of the weapons is awful; the original black looked much better and more realistic on them. All in all, this is a pretty good set with an imaginatively repainted dinosaur figure and a passable human figure. Sadly, both sculpts have no action features to complement each other. The T-Rex logo on the Adventurer's cap is a nice little reference to its pet though, albeit unintended since it was already there to begin with. Repaint: yes. This is a repaint of the TLWS1 Junior T-Rex, with repainted accessories from that same figure. It was repainted only a short while before for JPD1's first wave of figures. The figure would be repainted a fourth time for JPD2. The Dino Adventurer is a TLWS1 Dieter Stark repaint (with repainted accessories from that same figure), featuring a repainted JPS2 Jaws Jackson's head sculpt. Overall rating: 7/10. This Young T-Rex sports a much more original, appealing and detailed paint job than its Wave 1 counterpart, and it's still one of the most movie accurate sculpts. The Adventurer is a decent repaint, but nothing too special, and his weaponry looks pretty dull. As part of Wave 2 of this toy line, this is one of the rarer JPD1 releases, and it can prove tough to find, especially in MOC or complete condition.